When I fist read this quote, it spoke volumes to me. I could picture one of those timelines you learn to do in school around 4th or 5th grade and know where to put everything on it as it related to my body image and weight issues. I have vivid recollections of negativity from my daddy, who honestly would not want to hurt me but his words have always spoke the loudest in my psyche. I remember the taste of the canned tuna and green beans that were allowed on the weight watchers plan when I first attended around age 8. I assume, from looking at pictures, that there as a time that I didn’t know anything was wrong with the way I looked. I guess you would say I was an average looking kid with an average weight. Not as skinny as some but not as big as some either. I also have the two sides of the family to think about their views on weight and body image. It’s really weird, because in some sense I had not self esteem issues. I wore anything I wanted, much of which was to “fashion forward” for my small town, and I did it without any problems. But, on the other hand I don’t much remember a time that I haven’t worried about what was on my plate. Somewhere between the pictures of the average size kid and the carefree adolescent who wore weird clothes, something happened and I became the “fat” kid. I don’t remember being anything else in school, but the fat kid. I was taller and matured at a much faster rate than my classmates. I guess compared to their yet matured body I was fat. I do remember kids sort of making fun of me, but nothing jumps out at me. So, I cannot decide if the body image concern was from classmates or family. I don’t remember not being able to play sports, participate in games, or anything like that. I remember passing the President’s Physical Fitness challenge, so I couldn’t have been that bad off. I was just different. I’ve never fit any sort of mold, much less one of the small town molds. So, that leads me to 2 very crucial incidents that can never be taken back and I can never get them out of my mind and they seem to be the start of me questioning myself. *Side note* as I type this I am thinking….even when girls start getting noticed my boys, I wasn’t all that heavy. I was big boned, athletic, but I danced for crying out loud. I did backbends and back handsprings. Yes, I remember being upset that boys didn’t “like” me, but I’m starting to think that it had nothing to do with my size. Probably my attitude and self assuredness. Like I said, I was not size 2, but I’m remembering some pictures in my head, and I wasn’t a size 22 either. So, again I have to search myself to know if the body image has been created because of those around me or because of my social interactions with peers * End random thought process…. Weight watchers and 8 years old and the fear that “you will be like your Aunt, big as the side of a house”. Yep, that’s it folks. The 2 doozies that have haunted me. Why did I go to weight watchers at age 8? Again, I tell you, the pictures were not grotesque. Heck, my cousin right now has a 10 year old that wears a size 38 in pants. That may be cause for concern. But not looking back on ME. I tell you why I think I went to WW at age 8. 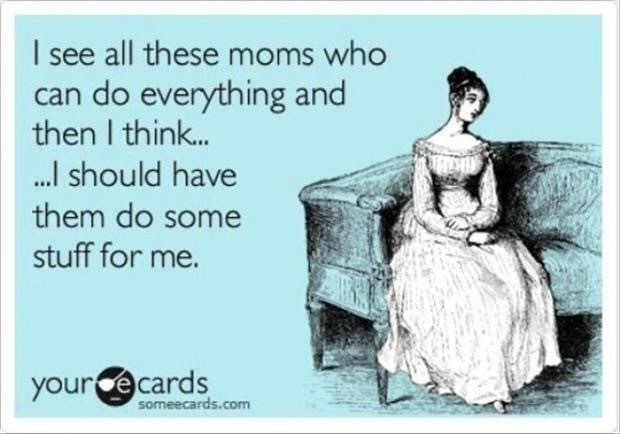 Because my mother did. Because my grandmother did. Because I had a tiny seed in my head that maybe I needed to be like the petite girls in my class and since 2 of the influential women in my life were going to WW to loose weight it made sense that I would go to. Okay. WHY did my mother let me? I’m sure she did it out of love and support, thinking that it might help my slightly damaged self esteem. Oh boy! It took a slightly damaged self esteem and confirmed that there was something wrong with me that should be fixed and just drove a tornado through my adolescent self esteem. Because now all I can remember is that I went to WW at 8 years old. All I can see is the affirmation that I did need to be fixed, that I did need to loose weight in order to be an acceptable member of society. Okay, next lesson. My Aunt also inherited the “B” and “M” genes from our family. They are just big people. I’ve seen pictures of my aunt growing up and she is just a big girl. Not a “fat” girl. But, my entire life she has been overweight. I didn’t question it has a small child, not until my grandmother, a petite 5’3″, started saying things to me. Again, I’m sure trying to be supportive. But what they didn’t realize and what so many adults don’t realize today is, if you have a child who isn’t questioning these things…weight, self esteem, acceptance, etc…and you decide “lets be proactive” and talk about it, you have now opened up a host of questions for this child to think about. “If my parents are talking to me about (fill in the blank), then it must BE IMPORTANT< MY PARENTS LOVE ME AND WANT ME HAPPY> THGEY WOULDN”T TALK TO ME ABOUT SELF ESTEEM AND MY WEIGHT IF I didn’t have a problem”. I just think that parents need to think about the influence they have over their children. But, I digress. So, as I said my aunt has been overweight as long as I’ve been alive. My daddy went through some health transformation when I was around 5 years old and has been fit ever since. I remember being at my grandmother’s dinner table and I apparently reached on his plate to take a bite of something. He quickly responded, “if you continue to eat like that you will end up like your Aunt Betty, big as the side of a house.” No, my aunt is not that overweight. Whew! I need a couch and an expensive bill after that therapy session. Dr. Melfi has nothing on me. I will return with part II.